As being one of the reputed manufacturer, supplier and exporter of the different kinds of the surface grinder machines, we offer precisely engineered hydraulic surface grinder machine, built by following international norms and conditions. Being an ISO certified company; we offer reliable range of the machines. High grade material is used to fabricate the machine. Our machines are tested as per IS 2743: 1992. 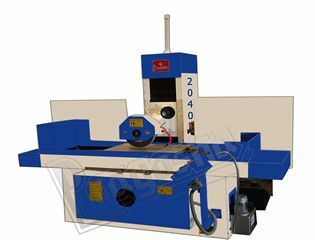 Our hydraulic surface grinder machines are available with various table sizes, from 500mm X 1000 mm. It contains longitudinal travel of 1075 mm, cross transverse of 550 mm. highly even and noiseless operations of table are supported with precise guide ways. Spindle center height is above table of 700 mm. mechanism of spindle make easy movement of the machine. It is loaded with the spring and anti-friction bearings. Speed of the table is about 18 m/min with power cross transverse of 1000mm/ min. for the grinding, our machine contains 5 hp spindle motor support. It is provided with capacity of 1400 RPM. Machine is provided with hydraulic tank with capacity of 150 liters. Machine is designed considering minimum utilization of floor space. Compact model of machine is available with 2900mm X 2100 mm size. It is preferred for its characteristics of no vibration, no noise. Wheel head contains independent motor for function.